My wife and I collected all the litter we could find on the pebble beach at La Valette on the morning of 21 June 2009 (previous image). We returned that evening at dusk to find this litter on the shore. 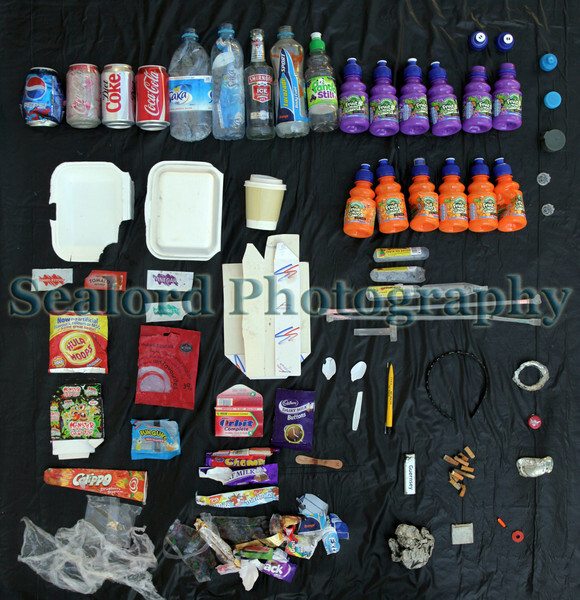 This image shows the litter left on the shore by La Valette bathing pools during a 12 hour period. One party of people had left twelve Robinson's Fruit shoot plastic bottles in one location on the shore. The remaining amount of litter is minor but because most of this litter is not biodegradable it will accumulate on the beach and possibly impact wildlife and present an aesthetic nuisance to tourists and residents. The plastic bottles and aluminium cans can be recycled. This litter was photographed the following morning on 22 June 2009.